PALO ALTO, CA--(Marketwired - Apr 21, 2017) - HP Inc. (NYSE: HPQ) today announced its most secure and manageable HP ZBook Mobile Workstations to-date. The new solutions-packed devices include award-winning display technology, 3D graphics and server-grade processing power -- all in a compact, mobile design. With its new workstation line up, HP continues to offer world-class innovation to power filmmakers, designers, artists, explorers and other visionary thinkers. "As a longtime partner to the creative industry, Z Workstations have earned their position as the ultimate innovative and reliable technology for creators," said Josh Peterson, vice president of product management for Z Workstations. "Our fourth generation ZBook Mobile Workstations are the most secure and manageable mobile workstations1 in the industry. By protecting the intellectual property of digital creators everywhere, HP enables the creative industry to focus on bringing their best work to-life without the worry of IP theft or breaches." HP is reinventing device security for its fourth generation ZBook Mobile Workstations by providing several unique security features including: HP Sure Start Gen32, the industry's first self-healing PC BIOS with comprehensive encryption, strong authentication, malware protection, data protection, identity assurance, and threat detection and response. The HP ZBook Studio, HP's premium mobile workstation built for creative visionaries including filmmakers, architects, and engineers, now boosts up to 16.5 hours of battery life.3 The HP ZBook Studio offers exhilarating power only thought possible with a workstation desktop, in a sleek, modern, stunning mobile design, and is meticulously crafted with fully-machined aluminum, diamond-cut edges and a stunning HP DreamColor 4K UHD display4 which supports 100 percent Adobe® RGB. At just 18mm thin and starting at 4.6 lbs.5, experience the power of the world's first quad core workstation Ultrabook™.6 Engineered with powerful server-grade Intel® Xeon® or 7th generation Core™ processors,7 NVIDIA® Quadro® professional graphics and up to 2TB8 storage, dual HP Z Turbo Drives4 and dual Thunderbolt™ 3 ports supporting full 40 Gb/s bandwidth. The HP ZBook 17 delivers HP's ultimate power and performance. The HP ZBook 17 is equipped with a choice of the latest Intel® Xeon® or 7th generation Core™ processors7, NVIDIA® Quadro® or AMD RadeonPro™ graphics, up to 4 TB of storage8, dual Thunderbolt™ 3 ports and more. The HP ZBook 17 can also be configured with optimal horsepower and graphics cards to bring VR content to-life in an ultra-smooth 90 FPS VR experience on two graphics card options. The HP ZBook 15 is used by NASA to help push the boundaries of science and discovery on the International Space Station. HP ZBook Mobile Workstations endure 120,000 hours of testing and are made for demanding workloads with Intel® Xeon® or 7th generation Core™ processors7, with up to 3 TB storage8 and NVIDIA® Quadro® or AMD RadeonPro™ graphics. HP conducts advanced testing and performance benchmarks to deliver the optimal experience with the most important applications from leading software partners like Adobe® and Autodesk. 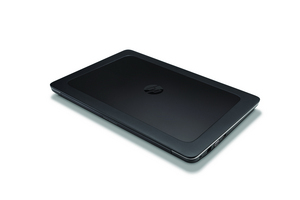 The HP ZBook 14u is HP's smallest and lightest mobile workstation. This Ultrabook™ workstation delivers extraordinary levels of power and graphics capability in a slim design at just 22mm thin and weighing as little as 3.61 lbs.5 With impressive design features including a 14" diagonal FHD display with optional touch, AMD FirePro™ 3D graphics with 2GB of video memory, the latest 7th generation Intel® Core™ processors, up to 32 GB memory and up to 2TB of storage.8 Plus, it's certified for major software applications, so you can work faster across multiple applications. Customers requiring a workstation Ultrabook with a 15" diagonal display can choose the recently announced HP ZBook 15u. 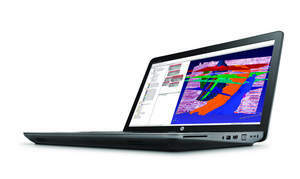 Based on HP's unique and comprehensive security capabilities at no additional cost and HP's Manageability Integration Kit's management of every aspect of a PC including hardware, BIOS and software management using Microsoft System Center Configuration Manager among mobile workstation vendors as of Jan. 2017 on HP Mobile Workstations with 7th Gen Intel® Processors. 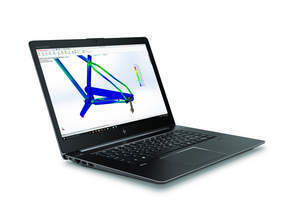 "World's first quad core workstation Ultrabook™" *Based on HP's internal analysis of all mobile workstation models from any vendors with >200 thousand unit annual sales as of October 29, 2015, having Quad-core CPU's, with Intel's Ultrabook Certification.